Can the Hayemaker step closer to a match with one of the Klitschkos, or will he fail on his first defence of the Heavyweight Championship? 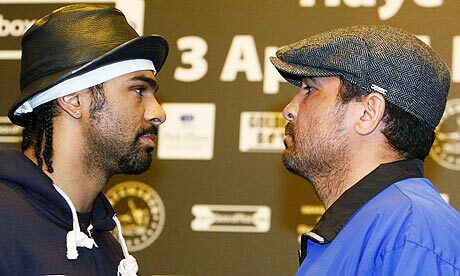 David Haye will be the heaviest he's been when he takes on John Ruiz on Saturday. The WBA heavyweight world champion tipped the scales at 15st 12lbs which is five pounds more than he weighed for his win over Nikolai Valuev in November. Ruiz, fighting for a world title for the 11th time, came in almost a stone heavier at 16st 7lbs - six pounds shy of his own career high but nine heavier than the Briton - and kept his top on. Haye entered the Great Hall in Manchester's Town Hall to a rousing reception and stripped to the waist as if to prove all the talk of excess weight is completely unfounded. The pair then posed for the traditional face-off and although the crowd cheered as they stood inches apart, there was not a trace of bad blood between the two. Many experts had voiced concerns around Haye's physique in this week's build-up but the WBA champion pointed out that he was also only five pounds heavier than when he made his heavyweight debut against Tomasz Bonin three years ago. "I think I'm developing into a heavyweight," he told Sky Sports News. "I've never been one of those guys who comes over-muscly or too bulked up. "I've done everything gradually and I feel fit and healthy at this weight." Trainer Adam Booth revealed Haye's camp have not been concerned with poundage throughout the training camp and Sky Sports' Jim Watt agreed. He also believes Haye will back to his explosive best after an unusually subdued run-up to the fight. "There's not one ounce that shouldn't be there and look at the muscle definition and the look in his eyes - he is confident and he still has that mischievous glint that we always see from him," he said. "I am not in the least bit troubled. He might be five pounds heavier but he looks in fantastic condition." Who's watching this one? Any Predictions? I'm out tonight, so I might try and find a pub that has it on. I reckon Haye will take it on points. If Haye doesn't win he'll go down as the biggest failure of all time. Ruiz has been hand selected with having no real intention of actually beating Haye. In Haye's home country. He's got all the momentum right now. And Ruiz is past it. Britain's David Haye defended his WBA heavyweight crown with a ninth-round stoppage of an obdurate and courageous John Ruiz in Manchester. Haye floored Ruiz just 25 seconds into the encounter, but the American challenger showed tremendous bravery and powers of recovery to survive. For a short while it looked as if Ruiz was working his way back into the fight. But the badly-marked 38-year-old was down in the fifth and again in the sixth before his corner called a halt three rounds later. Haye's brutal victory over a man who had only been stopped once in 54 previous encounters makes inevitable a unification clash with either WBC champion Vitali Klitschko or his younger brother Wladimir, the IBF and WBO title-holder. "I was over the moon, really happy with it - I felt I was really sharp," Haye, 29, told BBC Radio 5 live. "There were a load of fans here. The crowd has been absolutely electric for me. There was a 20,000 capacity here with everyone screaming the 'Hayemaker'. With performances like that I'll keep the fans behind me. I loved the whole occasion." As expected, Haye, energised by a 20,000 capacity crowd at the MEN Arena, sprang out of the traps at the sound of the first bell and had Ruiz over with his first real attack, a left-right combination right on the button. The American rose but looked unsteady on his feet. Haye immediately went in for the kill, only for Ruiz to cover up well and somehow managed to remain upright. Ruiz was down again halfway through the round, although this time referee Guillermo Perez judged Haye had hit Ruiz on the back of the head and docked him two points for a deliberate foul. Ruiz, a veteran of 10 world title fights and a two-time world champion, rallied well and even landed with a couple of solid right hands of his own towards the end of the round, just to remind Haye he was still there. He may well have nicked the second before Haye upped his work-rate in the third, peppering Ruiz with ramrod jabs and rocking him repeatedly with huge right hands. Ruiz had more success in the fourth, with Haye not moving his head as effectively as he had been - and the sight of Haye grabbing his gumshield at the bell suggested the fight was far from over. But Ruiz, who had no answer to Haye's speed, wore a pair of juddering right crosses at the start of the fifth before he was forced to take a knee after yet another massive right hand. Ruiz, his face by now masked with blood, was down for a fourth time in the sixth, this time courtesy of a chopping right hook, and the challenger's trainer Miguel Diaz indicated that the next round might be his final throw of the dice. But Haye coasted the seventh, meaning Ruiz, who never stopped coming forward despite the damage he was sustaining, was sent out again. A scything uppercut had Ruiz backpedalling at the start of the eighth and, after another tremendous barrage it looked like he might go over again. But Haye, feeling the pace himself, stood off. After more one-way traffic in the ninth, Diaz finally waved the white flag two minutes and one second into the round to save his man further punishment. With his victory, Haye becomes the first British fighter to defend a heavyweight world title on home soil since Lennox Lewis beat South Africa's Francois Botha at the London Arena in 2000. When Haye, whose record now reads 24 wins (22 knockouts) and one defeat, beat Nikolay Valuev to claim the WBA belt last November, there was a rematch clause in the contract, but the hope is the Russian will be paid to step aside. Haye wants a fight against either Klitschko to take place at London's Wembley Stadium, although the Ukrainian siblings would prefer it to happen in their adopted Germany where they command huge television audiences and would have little problem filling a football stadium. Haye was all set to fight Wladimir in Gelsenkirchen last June before Haye pulled out with a back injury, but the Englishman will use the impressive nature of his victory over Ruiz to claim he is now the bigger draw. I'll try and find a download for those who haven't seen the fight. So Haye didnt just run away for most of the fight again? I didn't see the fight, as they were only showing it in the casinos in Cardiff and none of the pubs, but Haye looked pretty dominant - and the agressor. It'll be a different story if he takes on one of the Klitschkos next though. I hope he faces a Klitschko next. At least that should be a real test for him. Like Kalashnikov said, Ruiz was never going to cause Haye any problems.